The mighty fortress on Castle Rock towers over the city skyline in such a way that you can always see it and has dominated its surroundings for 3,000 years. Human habitation of the site dates back as far as the ninth century BC. During the Roman occupation of Scotland in the first and second centuries AD, it was a thriving settlement known as the stronghold of Eidyn. When the Angles invaded, some 500 years later, the rock became known by its English name, Edinburgh. There has been a royal castle here since at least the reign of David I in the 12th century, when St Margaret’s Chapel was built. Still standing, the tiny chapel is the oldest building in Edinburgh. 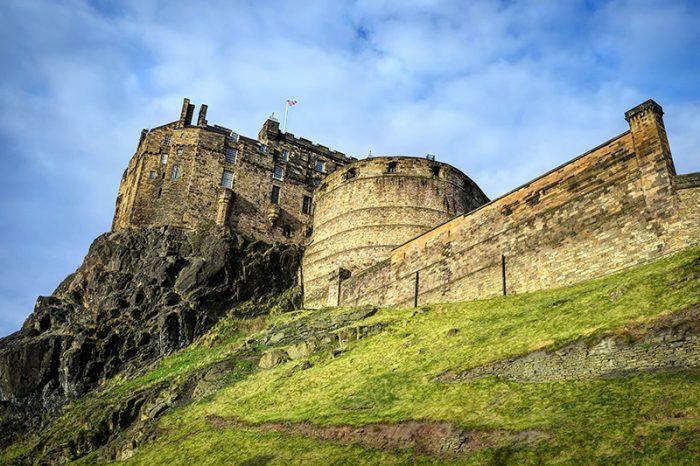 Edinburgh Castle’s place in British history cannot be underestimated. This is where Scotland’s kings and queens lived when they were in town. It’s where Mary Queen of Scots gave birth to her only child who became King James VI of Scotland and James I of England. Its Crown Room is where the Scottish Crown Jewels are kept. It’s also where you’ll find the Scottish National War Memorial, and the National War Museum of Scotland. The Crown Jewels are, of course, a big attraction – the crown, sword and sceptre, dating from the late 15th and early 16th centuries, are amongst the oldest regalia in Europe and are displayed alongside the Stone of Destiny, the coronation seat of Scottish Kings. Edinburgh’s centre is divided into two parts, Old Town and New Town, divided by Princes Street, which runs below the Castle from east to west of the city. The contrast between them, together with the setting of Edinburgh Castle, right in the middle, persuaded Unesco to make the entire area a World Heritage Site in 1995. Edinburgh Castle was also voted ‘Best UK Heritage Attraction’ at the 2011 British Travel Awards.